The legal framework of Sri Lanka is complex and a mixture of laws ranging from Rome, England, Holland, South India and Old Ceylon. The religious and colonial history of the nation, traced from 1505 to 1948, is the factor responsible for this rich legislative inheritance. The Sri Lankan judicial system has the Supreme Court as the apex court of the nation followed by the Court of Appeal, High Court, District Courts, Magistrates' Courts and Primary Courts. The Laws of Sri Lanka is intended to be the tool for both the legal community and the general public. 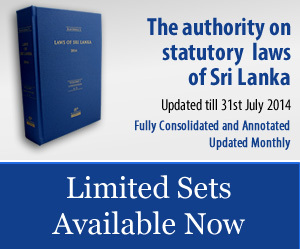 The object of the Laws of Sri Lanka is to make all the statutory laws of Sri Lanka in force available at one source on the internet and also on CD-ROM and in print in an updated consolidated form, to all persons interested in the laws of Sri Lanka. The Laws of Sri Lanka is such that any Sri Lankan enactment can be searched easily on the internet chronologically as well as in alphabetical order with annotated amendments. Subscribers to the website have access to Clean Acts and amended annotated Acts. • Alphabetical and Chronological Tables. • All Acts are presented in fully consolidated and annotated form. • Acts can be searched and printed in pdf and text formats.